For the last few weeks I've been using Sano Phytoceramides Capsules. Have you heard all the buzz about Phytoceramides? ★ BEST VALUE ON AMAZON ★ There are hundreds of choices to choose from, but only Sano Naturals stands out from the crowd. Our potent formula that contains the industry leading 350 mg (compared to the other 99% of Phytoceramide sellers whose products contain ONLY 40mg of Phytoceramdies or less and have gelatin in them). Our Plant-Based Ceramide Capsules Contain Crucial Vitamins for Skin A, C, D and E for Maximum Anti Wrinkle, Anti Aging Effects in a 100% Vegan Capsule. ★ DO YOU HATE IT WHEN PEOPLE THINK YOU'RE OLDER THAN YOUR AGE? ★ If yes, you NEED to try our product risk free. Just 1 veggie capsules a day = 350mg of PLANT-DERIVED CERAMIDES (the most important ingredient). This is the MAXIMUM, OPTIMAL recommended daily dose by dermatologists as the most effective dosage. All of our supplements are 100% PURE, SAFE & EFFECTIVE. Every batch made is manufactured in an a USA based FDA approved facility. We use only the very BEST ingredients in our products. This means absolutely NO fillers, NO binders, and NO artificial ingredients. ★ DON'T TRUST COMPANIES that claim 40mg of Rice-Based Ceramides are better than 350mg of Ceramides. IT'S SIMPLY NOT TRUE! The "Clinical Study" they refer to doesn't even mention 350 mg of Wheat-Based Ceramides. The "Clinical Study" does not compare 40 mg of Rice-Based Ceramides to 350 mg of Wheat-Based Ceramides. Do your own research. Many, many dermatologists recommend 350 mg of Wheat-Based Ceramides. You can find their Television clips and recommendations online. Rice-Based Ceramides Should ONLY Be Used By Those With a Wheat Allergy. ★ DO PHYTOCERAMIDES REALLY WORK? ★ A famous doctor on T.V., as well as many other dermatologists, consider 350 mg of Wheat-Derived Phytoceramides to be a "Facelift in a Bottle." That T.V. Doctor even named it his #2 Secret to "Drop a Decade From Your Face" (#1 is Topical Vitamin C!) The main ingredient in Plant-Derived Ceramides replenishes the ceramides that your skin loses over time. Studies have shown that Phytoceramides can possibly INCREASE MOISTURE RETENTION which drastically affects the appearance of fine lines and wrinkles. These capsules come in a small plastic bottle that is just perfect for tucking in your purse. Take one capsule daily, and for optimal results, take it for at least 60 days! I love the fact that they use vegan capsules, and non-gmo wheat! I seek out companies who use non-gmo ingredients and we prefer to buy vegan capsules when we can. These capsules are made with the best ingredients, and I'm looking forward to seeing results soon! I am very pleased with the customer service received, as well as the very fast shipping. I'm super-impressed with this product! 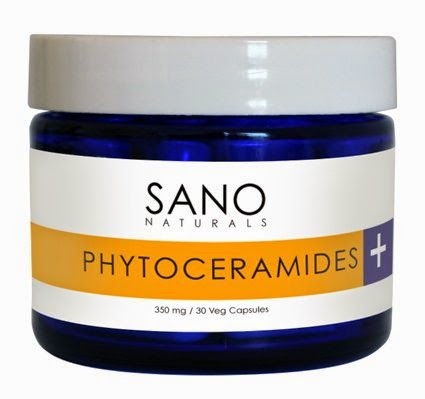 If you like what you've read, you can order a jar of Sano Phytoceramides for yourself here!